Over the past 20 years, archeological research in the Central Andes has identified the north central coast of Peru as an epicenter of early social complexity . Over the course of the Late Archaic Period (3000–1800 B.C. ), a stretch of the north central Peruvian coast known locally as the Norte Chico (“Little North”) witnessed the transition from relatively simple forms of sociopolitical organization to more complex ones. During this time, groups both on the coast and in the highlands underwent a transition from mobile hunting, fishing, and gathering to a sedentary lifestyle in which they established permanent villages. Plant domestication intensified as irrigation agriculture assumed greater importance as a subsistence practice. The most dramatic cultural transformation of the Late Archaic Period , and most conspicuous from an archeological perspective, was the construction of monumental architecture. The Late Archaic occupation in the Norte Chico region was the focus of a major cultural florescence that consisted of at least 30 sites with large-scale ceremonial structures. 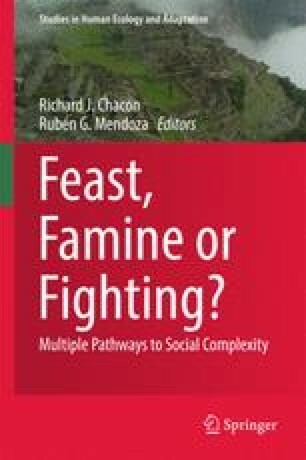 This chapter explores the various models that have been proposed to explain these cultural developments and ultimately posits that religion played a major role in the establishment of social complexity in the Central Andes during the Late Archaic Period .